Take some time to explore the rest of Orlando to see what this city really has to offer. Thanks in part to a certain “famous mouse,” Orlando has become known as “the Theme Park Capital of the World,” a place where tourists flock to shop, dine, lounge by the pool and spend a few days visiting an amusement park or two. While the construction of Walt Disney’s famous park was one of the most transformative events for Orlando’s economy back in 1965, Orlando shouldn’t be dismissed as just a destination for slightly creepy animatronic rides and pricey souvenirs. Orlando, a city that grew up around the U.S. Army built Fort Gatlin and was the hub of Florida’s citrus industry from 1875 to 1895 before becoming a popular tourist resort in between the Spanish-American War and World War I, is now home to many high-tech companies. Situated near Cape Canaveral Air Force Station and the Kennedy Space Center, Orlando is considered a hub for research and innovation, not just tourism. So before buying your ticket to the “Happiest Place on Earth,” take some time to explore the rest of Orlando to see what this city really has to offer. BEYOND DISNEY. It’s always tough to pass up a trip to Disney World or Universal Studios when traveling to Orlando, but sometimes it’s worth it. Orlando has countless attractions outside of their two most well-known parks that are certain to entertain everyone in the family. You don’t have to visit Buzz Lightyear at the new Toy Story Land in order to learn about the galaxy. You can actually travel to “infinity and beyond” by visiting Kennedy Space Center, just an hour outside of Orlando on Florida’s Space Coast. At Kennedy Space Center, you can tour the astronaut hall of fame, visit a launch control center, experience a simulated space launch, or take a guided bus tour of the center, where you’ll see historic launch sites and working spaceflight facilities. You can even spend a day seeing if you have what it takes to become a NASA astronaut. The Kennedy Space Center offers visitors plenty of immersive learning opportunities and a chance to experience the space program firsthand. They also have a free downloadable app where you can learn more about available attractions and view the special events and rocket launch schedules to help plan a side trip while you’re at PestWorld. While you’re in the area, consider visiting the Merritt Island Natural Wildlife Refuge, one of the largest and most diverse nature preserves in Florida. The peak wildlife season begins in October and the refuge actually supports one of the highest numbers of threatened and endangered species anywhere in the nation. If you’re traveling by car, take advantage of the Black Point Wildlife Drive, a 7-mile auto tour that takes you by the most popular wildlife viewing areas. There are also six hiking trails throughout the refuge and exhibits to explore at the Visitor Center. For the best view of Orlando, take a ride on the ICON Orlando, the tallest observation wheel on the East Coast. If you go at the right time, you may even be able to enjoy the nightly Disney fireworks without having to pay for park admission! Along with dining and shopping options, there are other attractions nearby, including the SEA LIFE Orlando Aquarium and the Orlando StarFlyer, a 450-foot tall set of swings that rotate 360 degrees at speeds up to 45 miles per hour. (Clockwise, from top left photo): Downtown Orlando; Cinderella Castle; Kennedy Space Center; and Gatorland. DISNEY AND UNIVERSAL. If your PestWorld trip really wouldn’t be complete without a stop at Disney World, be sure to also take advantage of some of the special events that go on throughout the parks. On select nights from Aug. 17 through Oct. 31, Disney’s Magic Kingdom throws a Halloween party and encourages guests to dress in their favorite costumes, catch a parade or fireworks show and even collect some candy along the way. This year, Disney also made some festive changes to a few of the parks’ classic rides. Disney World’s newest addition is Toy Story Land in Disney’s Hollywood Studios park. The area features two new rides, including the Slinky Dog Dash, a family friendly roller coaster, and the Alien Swirling Saucers. There’s also a new quick service restaurant featuring homemade pop-tarts, grilled cheese, loaded tater tots and specialty drinks. Don’t forget to say hi to Woody and Buzz and watch the parade of green army men who march through the land several times a day. Star Wars also has recently made its way to Hollywood Studios. Although the new theme land is still under construction, visitors to Hollywood Studios can still witness a Storm Trooper parade and children can take part in special Jedi training courses. If you’d like to travel to Pandora, be sure to head to the newest area of Disney’s Animal Kingdom park. Here you can sample exotic foods and enjoy two immersive rides that transport you into the mesmerizing world of Avatar. Over at Universal Studios Orlando, you have two parks to choose from — Universal’s Islands of Adventure and the main Universal Studios park. Islands of Adventure features Marvel Super Hero Island, Toon Lagoon, Seuss Landing, Jurassic Park and the ever-popular Wizarding World of Harry Potter, which recently added a new nighttime light show that is projected directly onto Hogwarts Castle each night. The flagship park offers visitors the opportunity to visit a real, working film and TV production facility, while also experiencing a vast array of rides, shows and attractions that feature some of your favorite film and television characters and involve you in all the action. DINING. It’s easy to just dine at your hotel when you’re staying at one of Orlando’s opulent resorts, but should you choose to venture further, there are plenty of options just outside your hotel door. For the best dining in Orlando, head to one of the eateries along Restaurant Row, a stretch of Sand Lake Road about five miles from Disney World. If you like southern comfort food in a sleek setting, head to Slate, one of the only locally-owned eateries on Restaurant Row. Start your meal with pimento cheese hush puppies or fried green tomatoes and move on to smoked brisket or diver scallops for dinner. The Pharmacy was the winner of Open Table’s 2018 Diner’s Choice Award and is modeled after a 1920s speakeasy. The drinks are called “elixers” and the meals are called “prescriptions.” The entrance may be hard to find at first, hidden behind an unmarked elevator door, but once you’re inside, you’ll feel like you’ve been transported to another time, as you drink craft cocktails and dine on fresh farm-to-table food. 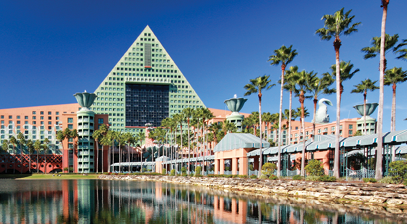 This year’s NPMA PestWorld 2018 host hotel is the Walt Disney World Swan and Dolphin Resort. The resort features well appointed, state-of-the-art guest rooms as well as an array of restaurants and lounges, ranging from casual family dining and poolside bars like the Cabana Beach Bar and The Fountain Eats and Sweets, to upscale eateries like Todd English’s Bluezoo and Il Mulino. The Swan and Dolphin Resort also is home to several specialty shops and the Mandara Spa, offering spa services and a full-service hair and nail salon. As a bonus, the hotels also offer complimentary scheduled transportation to all of the Walt Disney World theme parks, attractions and Disney resorts. There are five heated pools on the premises with whirlpools, fountains, waterfalls and even a water slide. PestWorld guests also can enjoy a game of sand volleyball, a beachside playground and watercraft rentals. After a long day attending sessions and roaming the exhibit hall floor, find some time to relax and enjoy all the amenities the Swan and Dolphin Resort have to offer. If you’d rather stay on-site for a nice meal, head to Kimonos within the Swan resort. Voted Critic’s Choice for the best sushi in Orlando by Orlando Sentinel readers, the sleek and modern Kimonos features a vast selection of sushi rolls and sashimi, as well as tempura shrimp, kobe beef and panko softshell crab appetizers. Kimonos also offers hot or cold sake, wine, beer and specialty cocktails, and nightly karaoke in the lounge. For those who like dining with their favorite Disney characters, Garden Grove, also located in the Swan Resort, has what you’re looking for. The buffet-style restaurant features a beautiful 25-foot oak tree as its centerpiece decorated with delicate twinkling lights and paper lanterns that will make you feel as if you’re dining outside in a quaint park. You can choose from an unlimited buffet of gourmet vegetables, soups and salads, as well as prime rib and cedar plank salmon. NIGHTLIFE. For fun after dark, the local theme parks have gotten things right. Downtown Disney has recently been reimagined as Disney Springs, a family-friendly shopping, dining and entertainment destination by day, and a hot spot for adults when the sun goes down. Disney Springs features a dine-in movie theater, a state-of-the-art bowling alley and live music and entertainment at various venues. If you’re looking for craft cocktails in a unique atmosphere, head to The Edison. This restaurant and bar has been designed to look like a 1920s electric company, with different themed rooms to explore including “The Patent Office,” “The Tesla Lounge,” and “The Ember Parlour.” There is also a steady lineup of entertainment ranging from contortionists, to aerialists, to live cabaret. If you decide to visit after 10 p.m., keep in mind the dress code and leave your flip flops and ball caps at the hotel. If wine is more your style, head to Wine Bar George, a sophisticated wine bar featuring rustic décor and expansive windows that provide a stunning view of Disney Springs. Wine Bar George offers more than 130 varieties of wine hand-picked by master Sommelier George Miliotes. They also have an impressive selection of wines on tap, along with beer, cocktails and small plates. The wine bar is open late, but if you’re interested in grabbing a quick meal and a drink, be sure to take advantage of The Basket, a counter service area connected to the wine bar that offers picnic baskets, sandwiches and small bites to go. Universal CityWalk, located just across the water from Universal Studios, also has plenty to offer after dark. If you want to feel like you’ve landed on a tropical island, you should make your way to Lone Palm Airport, a waterfront tiki bar located under the wings of Jimmy Buffet’s seaplane, the Hemisphere Dancer. Enjoy a specialty frozen cocktail and a snack while you dip your toes in the sand and let your worries slip away. For those who like to cap off their night with a decadent dessert, the Toothsome Chocolate Emporium & Savory Feast Kitchen has what you’re looking for. The restaurant, bar and confectionary is hard to miss with its chocolate factory-esque façade and Steampunk décor. It’s also open late and offers a full menu, along with a seemingly endless selection of gourmet chocolates and other sweets. Be sure to sample one of the artisanal milkshakes, featuring flavors like Bacon Brittle and Chocolate Brownie Bark. SO MANY OPTIONS, SO LITTLE TIME. It’s not hard to find things to keep you entertained in Orlando. With so many theme park, dining and entertainment opportunities, you’re sure to never be bored. Whether you want to enjoy a relaxing dip in the pool, an up close and personal interaction with a swamp gator, or a ride on Space Mountain, you’ll find what you’re looking for here. So take some time to enjoy some fun in the sun and maybe explore some of the lesser known areas of this much-loved vacation destination. The author is based in Cleveland, Ohio and can be contacted at hmoreland@gie.net.